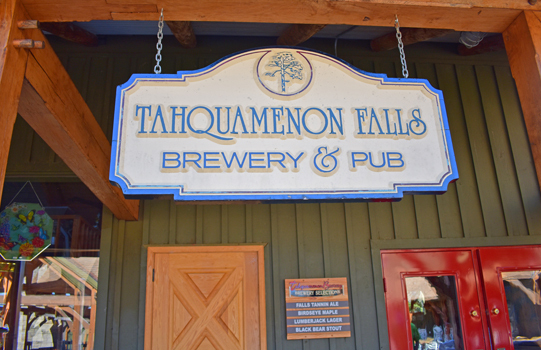 Tahquamenon Falls Brewery and Pub is currently closed for our seasonal spring break from April 8th through April 25th, 2019. We will be reopening on April 26th through October 27th and closing on October 28th for our fall seasonal break. The beautiful Tahquamenon Falls Brewery & Pub is unique and welcoming. 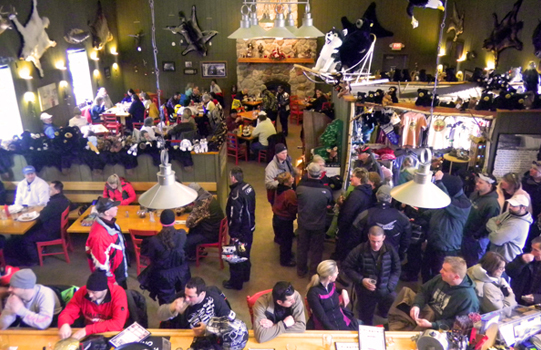 As you walk into our Upper Peninsula Micro Brewery, the rustic long bar and equipment tempt your interest immediately. It's magnificent size and grandeur is breathtaking. The atmosphere and decor echoes the beauty of the Tahquamenon Falls and the vision of the Camp 33 founder, Jack Barrett—grandfather of the current owner, Lark Ludlow (shown in photo). 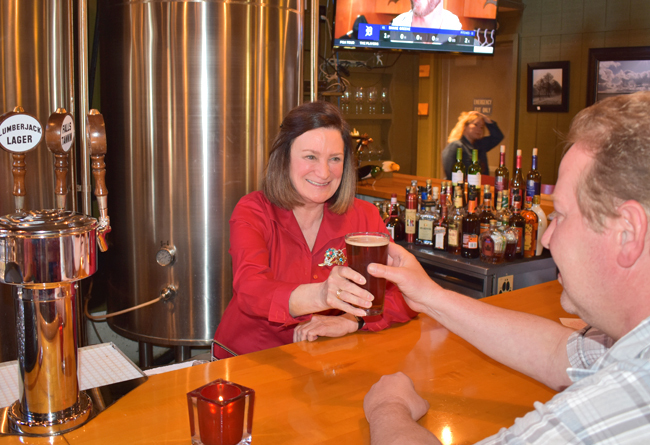 Owner, manager, designer and Master Brewer, Lark Ludlow compliments this establishment with her warm and sincere personality. She has definitely followed through with the vision of her grandparents and has gained the respect of many throughout the world. 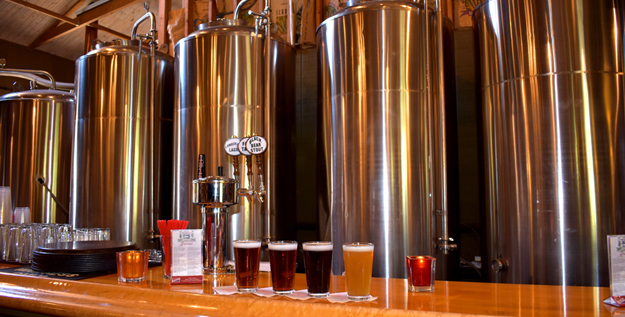 The details of the brewing process can be found on page 4 of the Restaurant Menu - PDF. 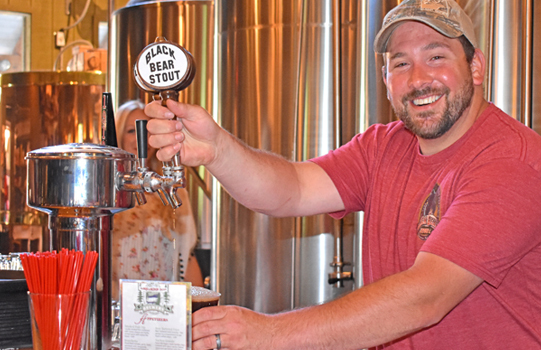 Our Upper Michigan Brewery is inviting, warm, friendly, and cradles a vision created in the days of lumberjacks and adventurers. Days gone past but not forgotten. 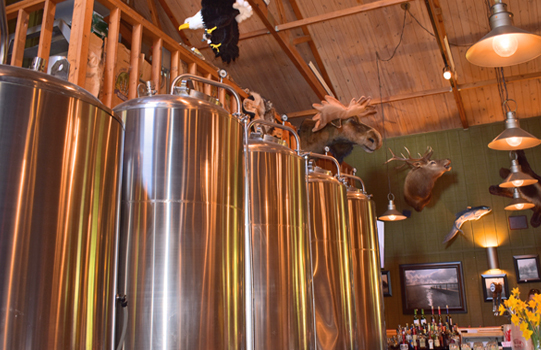 The Tahquamenon Falls Brewery & Pub also invites you to try a variety of our beers on tap during your visit. 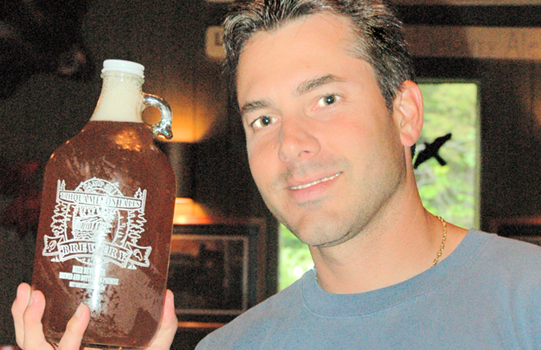 Our micro brewed beers are available in lovely collectible 1/2 gallon bottles featuring our logo. Please note that bottles must be kept cold after purchase. "The micro brew had a nice atmosphere. I had the fish and steak it was fantastic. The real star of the show was the Blueberry Beer. I cannot believe how good it was. 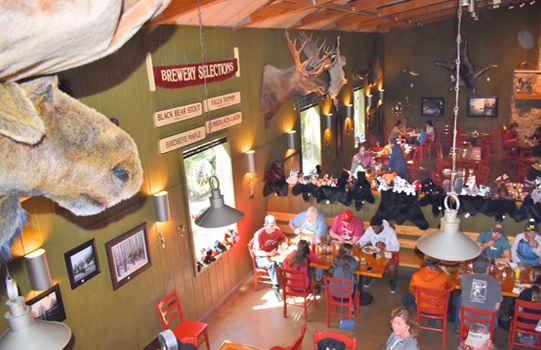 "—Bill H, Trip Advisor, 5 Stars"
"Had a terrific stop, with friendly service, while visiting the upper falls at this family and logging camp historical site, which is now hosting a Microbrewery and Pub. Brew selections sampled were as terrific as our meal. 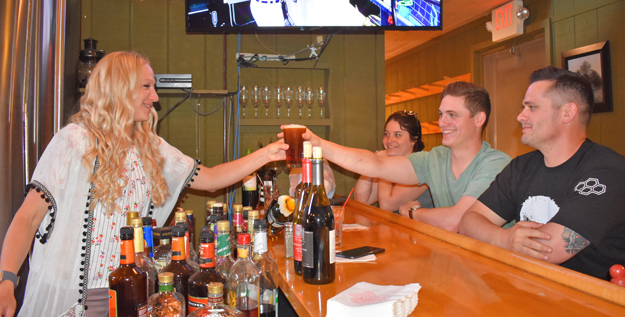 "—MJRGNSN, Trip Advisor, 5 Stars"
Micro Brewed Beer at the Tahquamenon Falls Brewery and Pub - Visit us today and Experience the charm of the Brewery & Pub. Copyright © 2018 - 2019 Tahquamenon Falls Brewery and Pub. Logos, web content in part or in whole may not be used without written consent. All photos are Copyrighted and are not permitted for any other use. All rights reserved.